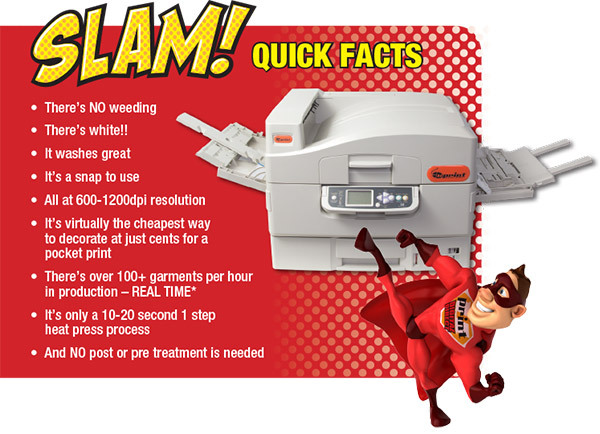 If you need to decorate ALL color garments quick – then SLAM is what you need. For light and dark cotton, polyester, wool, nylon, silk and whole LOT more. The all new U-Print-TST3 Trans Slam!! The U-Print Trans Slam is a revolution in the transfer to finished garment market. If your business is about color and quality and really fast production and you always wanted an inexpensive decoration process that doesn’t need chemicals or vinyl cutters and weeding (its only one transfer paper so a one step process only!!!) ITS AVAILABLE NOW. T-shirts – jackets – jeans – bandanas – caps – aprons – polos – leather – bags – umbrellas – sweats – sports clothing and retail fashion lines, more more more – its all now available – profitable – and extremely simple. Turn profits at virtually every corner with the all new U-Print Trans Slam. Decoration has never been this easy to the widest range of finished garments for a whole host of markets. In store or print for profit production – SLAM is perfect for budding entrepreneurs or seasoned production shops and retail application. With imaging areas from our SLAM Pack 1 – A4 of 210mm x 295mm (8x11inch) to our larger, SLAM Pack 2 – A3 at 420mm x 290mm (17x11inch). We have all the bases covered so you can create true profit areas like never before. The U-Print Trans Slam is the final answer in garment decoration and the proprietary process is a world first, designed for production with reliability engineered into every system by a team with over a decade of remarkable success in the garment printing industry. Impression Technology. It’s Affordable!! The SLAM pack comes complete with your SLAM A3/Tabloid laser SLAM imaging Rip, and 100 sheets of SLAM paper and a full CD instruction. If you are new to the garment arena – then we also include access to the award winning DecoNetwork online business creation tools.You need to check this out – it’s truly the most beneficial and supportive way to create an online business that we have seen. (Check it out at www.deconetwork.com). U-Print Trans Slam is brought to you by DTG Digital, a wholly owned subsidiary of Impression Technology. Simply import any graphic file format (as long as its hi-resolution) into the SLAM Rip and your image is created with a unique white underbase process – its all automatic! Print from the SLAM laser 23 sheets per minute* and get ready for your production run. Now – as there is no pre treat or post production – there also is no weeding or any finishing equipment required at all. Heat press at 320F/160C for 10-20 seconds medium pressure with the SLAM image transfer page directly to your garment – SLAM !! – warm peel the transfer paper away from your garment and your left with vibrant knock out colors on an incredibly opaque white background or even solid white within your image area as needed. Pack it – ship it – and get paid. *the fine print – production numbers and final decoration costs per garment are dependent on image size and how many heat presses are used. The A3 laser printer will output approximately 23 full pages per minute. Each heat press cycle time is 10-20 seconds per transfer sheet – with two heat presses or more, output is increased but you will need an extra pair of hands. Wash fastness and finished results are dependent on the quality of the heat press and consistency of heat they output – for this we can offer no support at all and results are completely subject to print trials undertaken prior to production. Its up to you to know what final production quality your client needs. Join our mailing list to receive all the latest information about U-Print Digital Transfer products and news! Fields marked with a * are required.